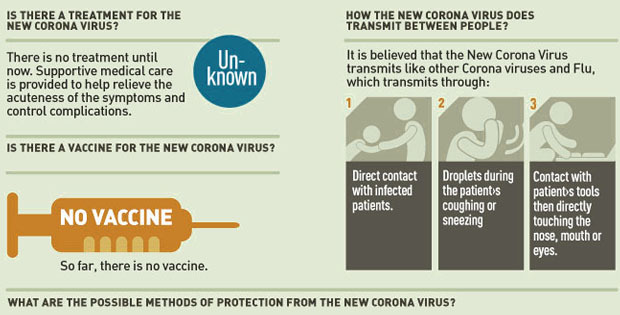 The following information has been provided by MOH Saudi Arabia about Corona Virus, its symptoms, Prevention, Treatments and vaccination information. It is a large group of viruses, which can affect both human and animals with cold related diseases. Its intensity ranges from common cold to acute respiratory syndrome (Pneumonia). 2. Fever (low to high grade). Direct Contact with infected patient. Droplets inhaled from patient’s cough and sneezing. Contact with patient’s tool and then touching your nose mouth and eyes. No specific treatment as strain is unknown. Supportive Treatment for fever cough, fever and other compliants. GOOD HAND HYGIENE BY CONSTANT WASHING. AVOID DIRECT CONTACT OF NOSE AND EYES AS MUCH AS POSSIBLE. AVOID INFECTED PERSONS TOOLS AND BELONGINGS. COVER YOUR NOSE AND MOUTH WHILE SNEEZING AND COUGHING WITH TISSUE. PROPERLY DISPOSE OFF USED TISSUES IN TRASHCANS. WASH FRUITS, VEGETABLES WELL BEFORE CONSUMING. KEEP HEALTHY LIFE STYLE AND DO REGULAR EXERCISE. ABOVE ALL PRAY 5 TIMES A DAY. Allah protect all of us from such incidents and diseases.